Guidance from industry experts and real case studies on how to launch a cyber security company in the UK market, including go-to-market, channel and PR strategies. Expert advice on how to start securing cyber security coverage in the national press through breaking news and proactive campaigns. 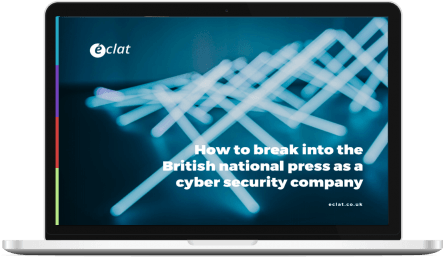 New research conducted by éclat Marketing and Apollo Research revealing how the UK national press covered cyber security in 2018. Cyber security is all we do. We know we can deliver, and that’s why we’re the only cyber security PR agency that offers a payment-by-results business model. We founded Code Red, a global network of cyber security PR professionals to take your message anywhere in the world. Are you a disruptive and ambitious cyber security company? We turn your experts into thought leaders by getting their voices heard in the market and by building credibility and brand advocates amongst industry influencers from the media, analyst community, and bloggers. Our knowledge and experience of the market helps us to develop tailored PR campaigns that generate news headlines and social media buzz around topical, issues-based ideas, rather than simply reacting to news stories that clients bring to us.